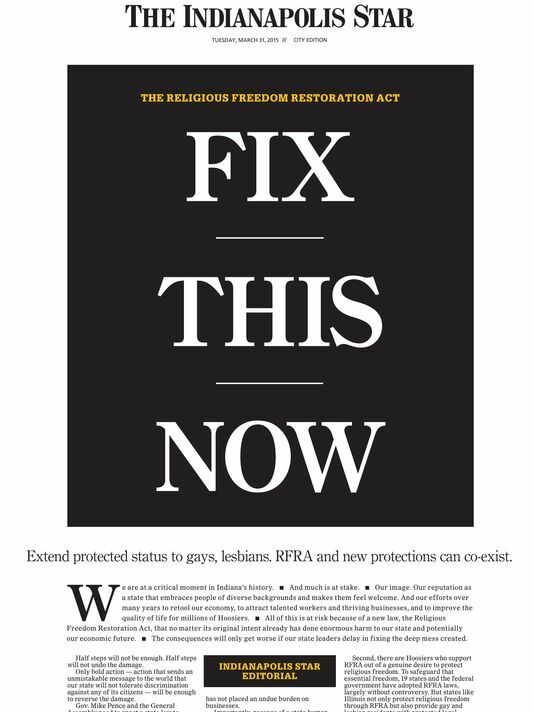 Indianapolis Star: Fix This Now! Indianapolis, for example, has had those legal protections in place for nearly a decade. Indy’s law applies to businesses with more than six employees, and exempts religious organizations and nonprofit groups. The city’s human rights ordinance provides strong legal protection — and peace of mind —for LGBT citizens; yet, it has not placed an undue burden on businesses. Importantly, passage of a state human rights law would send a clear message that Indiana will not tolerate discrimination. It’s crucial for that message to be communicated widely. On a practical level, by basing the state law on a 10-year-old ordinance, the General Assembly could move quickly to adopt the measure without fear of unintended consequences. If lawmakers can’t act in the next month, the governor should call a special session immediately after the regular session ends in April to take up human rights legislation. Next articleArkansas: we can do Indiana one better! With reasonable people be reasonable. With unreasonable people be unreasonable. To many democrats want to be reasonable with unreasonable people. Republicans can not be shamed as they are shameless. Republicans do not behave themselves out of decency because they are not! They only behave themselves out of fear and this scares democrats.